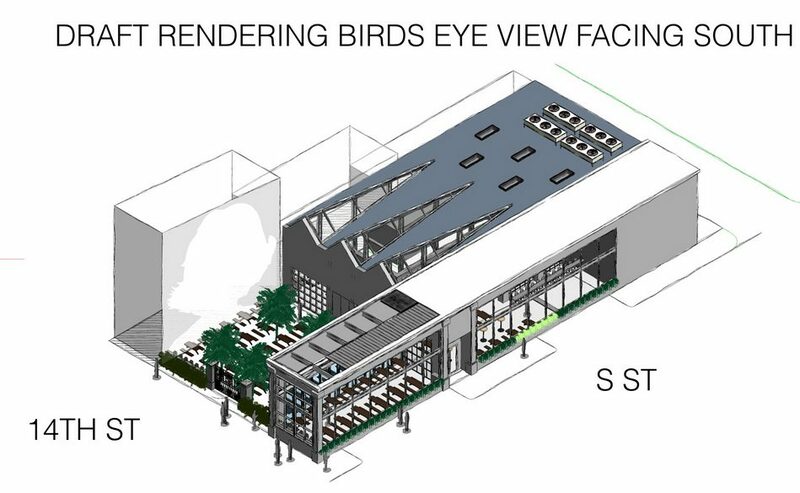 The updated building design was posted online today by Dacha proprietors Ilya Alter and Dmitri Chekaldin in their months-long effort seeking approval of a pending liquor license application. The D.C. Alcoholic Beverage Control (ABC) Board will consider the proposal in the coming weeks. A prominent component of the new design is a significantly expanded enclosed interior space. Nearly two-thirds of the total occupancy is now enclosed in response to concerns about noise. The bar-restaurant will not have live music, DJs, or performances – only low-volume background music typical of other nearby venues. The entire site length along S St and along the back alley will be fully encompassed by the building to provide for a complete sound barrier. The planned building, at an increased construction cost of nearly $3 million, will replace a barren corner lot currently used for parking. 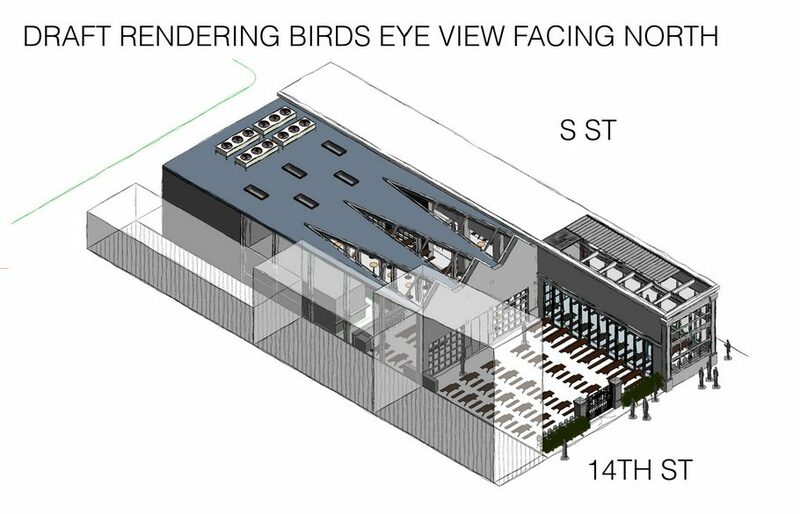 A much-reduced size, intimate outdoor table-seating courtyard will be surrounded on three sides by a new L-shaped building and an adjacent existing property. Only the 14th street side of the courtyard will be open to a pedestrian-filled promenade. 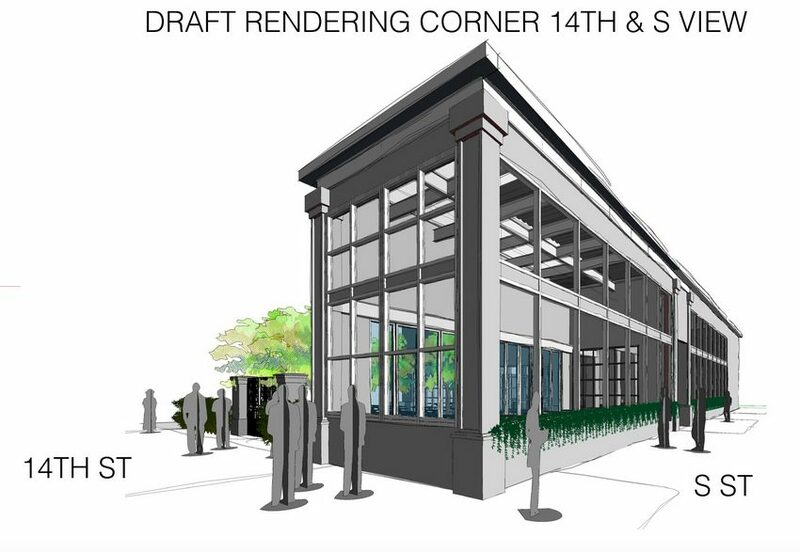 The Dacha Beer Garden on 14th will be the second full-service D.C. restaurant & bar built from the ground up in the past several decades of the city’s history. A complete set of revised draft building illustrations are available online for review on the Dacha website. Dacha is in the final phase of ABC licensing approval for a third venue to be located at the new Dock 79 development overlooking the waterfront in southeast D.C. That application was strongly supported by neighborhood residents and received the backing of the area Advisory Neighborhood Commission (ANC). The 14th St. site, at the heart of a major center of community hospitality venues, is situated at the nexus of three ANC districts. As a result, both the U Street and Dupont Circle ANCs are allowed to file comments either in support or opposition of the venue’s licensing application – in addition to the Logan Circle ANC in which the site is located. The Dupont Circle ANC, however, failed to file its protest with the ABC Board within the permitted time period, forfeiting legal standing to weigh-in on the matter. Dacha owners are optimistic that the new building design, along with expressions of neighborhood support by area and District residents for the venue, will persuade the Logan Circle and U Street ANCs to negotiate a licensing “Settlement Agreement” with the business and result in both groups supporting the new establishment. The Dupont Circle Citizens Association (DCCA) and the Shaw-Dupont Citizens Alliance (SDCA), both of which had previously proposed a total moratorium on all new liquor licenses throughout the entire MidCity area in 2012 that was successfully opposed by residents, have each filed licensing objections with the ABC Board. A license protest by an ad-hoc “group of 5 or more” D.C. residents living within an extended geographic area, allowed under city regulations, has also been filed with the Board. Making the world a better place, one beer at a time. In 2013 Ilya Alter and Dmitri Chekaldin opened one of the city’s first beer gardens in the northwest Shaw neighborhood. Dacha Beer Garden has proven extremely popular with a diverse mix and broad age-range of residents, while offering a premium selection of German, Belgian, and American craft beers, local meads and ciders, unique cocktails and select wines, along with a food menu and weekend brunch. The food menu derives inspiration from traditional Bavarian beer gardens and local farm to table recipes. From a mid-week happy hour, an evening dinner or weekend brunch, Dacha sets the mood for a pleasant conversation among friends, families, and co-workers. A simple yet elegant design seating, amicable staff, family friendly environment and commitment to social responsibility have made the Shaw location a popular destination in the district. Dacha family – the team who helped build the brand and customers who have and continue to support us. Together, we are on a journey to make a difference. We are committed to giving back to the communities where we do business. Whether it is through partnering with local businesses, hosting an event, in-kind donations, or volunteer work, we are working to improve the neighborhood where we reside.